Anchialine ponds are pools containing brackish or salt water that have no surface connection with the ocean. On Maui, they dot the southwest coastline of Maui on Cape Kïnau and Cape Hanamanioa. In this unit, students explore the anchialine pond habitat, using their reasoning abilities to develop hypotheses that explain the ponds’ characteristics as well as an interesting distribution pattern associated with the small red shrimp that inhabit many of these ponds. They also conduct an experiment to test the salinity tolerance of brine shrimp, which, like the red shrimp of the Maui ponds, are adapted to a range of habitat conditions. Students solve six “mysteries” related to anchialine ponds and red shrimp that are found in these ponds. Students conduct a lab to test brine shrimp tolerance for different salinity levels. 1. Why are anchialine ponds a special habitat on Haleakalā? 2. What are the unique characteristics of anchialine ponds and what geological and biological factors may help explain these characteristics? 3. How do brine shrimp respond to differences in salinity, a key environmental variable in anchialine ponds? Anchialine pond habitats. Hypothesizing. Tolerance to environmental extremes. 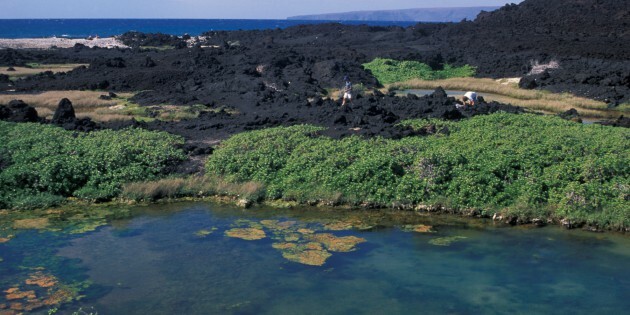 Anchialine ponds are a habitat type found on relatively few islands scattered around the world, including East Maui. These ponds are inhabited by species of small red shrimp that, despite their seeming isolation, are also associated with ponds in far-off parts of the world. • Build on Activity #2 “Salinity Tolerance Lab” by devising and conducting an experiment to investigate habitat preference among adult brine shrimp using environmental variables such as salinity, temperature, and light. One such experiment establishes condition gradients in water contained in flexible plastic tubing, allowing shrimp to congregate in the preferred conditions. By clamping the tubing into sections, students are able to sample along this gradient to determine habitat preferences. Maciolek, John A., ”Distribution and Biology of Indo-Pacific Insular Hypogeal Shrimps,” Bulletin of Marine Science, 1983, Vol. 33, No. 3, pp. 606-618. Science Junction, The Brine Shrimp Project. Includes a lesson plan for an investigation into the factors that affect the hatching and development of brine shrimp eggs.